The Spectrum IQ Infusion System strives to set a new standard of care in the medication administration process, while also offering a simple, standardized user experience to help reduce human programming errors. The Spectrum IQ Infusion System builds upon proven Spectrum infusion pump technology and our comprehensive approach to patient safety to make drug library compliance, protection for high-risk infusions and auto-programming consistently achievable for health systems. 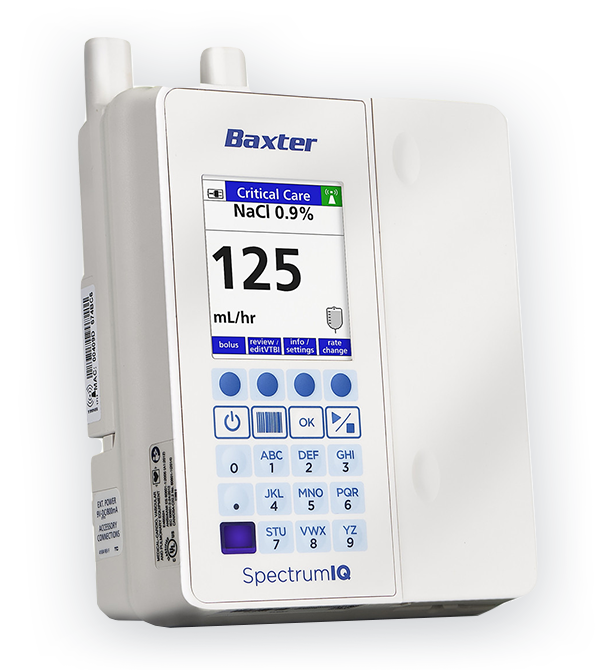 The Spectrum IQ Infusion System automatically defaults to the installed drug library and wirelessly updates the drug library ,without requiring clinicians to take extra steps to use pump safety features. Spectrum IQ Infusion System customers achieve an average of 97 percent drug library compliance within 1 month of implementation.2 Only Spectrum infusion pumps have titration error prevention enabled through a built-in Dose/Rate Change Alert feature designed to intercept manual and auto-programmed dose or rate changes that could be inaccurate and potentially harmful. Continuous quality improvement (CQI) analysis and pump data management capabilities are designed to help ensure the drug library supports clinical practice. Spectrum IQ Infusion Systems wirelessly update the fleet’s drug library, helping to ensure that programming is based on the most up-to-date drug information. Furthermore, access to FDB Infusion KnowledgeTM allows for a pre-populated, evidence-based drug library to be used as a starting point when building a smart pump drug library, simplifying and expediting drug library creation and maintenance. Only the Spectrum IQ Infusion Systems offer the built-in DeviceVue Asset Tracking Application, which displays both pump status and location data on a PC, tablet or smartphone without the need to interface with third party real-time location systems or be associated with an external tag. The Spectrum IQ Infusion System also provides secondary Alarm and Alert Routing to help improve efficiency of nursing staff, and can route alarm start/stop messages to secondary Alarm Management Systems along with CQI alarm reports. Spectrum IQ Infusion Systems with single set technology may help deliver efficiency improvements and cost savings. Single set technology can yield up to 53 percent cost savings in IV tubing sets and up to 30 percent reduction in IV tubing usage,4 and may reduce the number of setups and set changes, which can decrease the risk of touch contamination. *Charge Capture is specific to U.S. hospitals. Spectrum IQ Infusion Pump is Rx only. For the safe and proper use of the devices referenced here, refer to the complete Instructions for Use or the appropriate operator’s manual. About the Spectrum IQ Infusion System on our product website, or browse our eCatalog. Smart Pump EMR Interoperability Report. Orem, UT: KLAS Research; 2017. Available at: http://klasresearch.com. Data on file. Baxter Healthcare Corporation. DERS new implementation compliance data 2015. Data on File. Baxter Healthcare Corporation. Total cost of ownership – Standard set technology inventory and cost reduction data 2011-2013.